Fàilte! After clearing customs, you are greeted by Adventures by Disney representative who helps with your luggage. Relax as a driver whisks you away to the beautiful Balmoral Hotel. Get ready for a warm Scottish welcome when your Adventure Guides greet you within. Unwind from your trip and marvel at the stately décor while your Guides check you into this historic hotel. Say halò to your fellow Adventurers at this exclusive feast in the Balmoral's elegant dining room which overlooks Edinburgh's scenic cityscape. Raise a glass to toast the beginning of an unforgettable trip. Slainte! After a hearty Scottish breakfast at the hotel, climb aboard a coach for an excursion to the Palace of Holyroodhouse. A Blue Badge Guide leads you on a tour of this royal palace that is the Queen of England's official residence in Edinburgh. Over the centuries, great events at Holyroodhouse have shaped the fates of England, Scotland and France. Scotland's deadly struggles for power, love and family are all part of the history within. Follow a private guide through this collection of Scottish treasures! Imagine what it was like to be accused of witchcraft in medieval Scotland as your guide reveals the harrowing stories of a time before science when superstition reigned. Next, your guide introduces you to the Chessmen of Lewis—one of the most significant archaeological finds of the last 200 years. Merida and her mother play with these iconic chess pieces in the Disney•Pixar movie Brave! Join your fellow Adventurers for lunch in the National Museum. Our exclusive venue offers some of the best views of Edinburgh Castle in the entire city! Discover how this 103-year-old studio creates tapestries through a rich collaboration between artists, weavers and commissioners. An expert demonstrates the fundamentals of this ancient art and invites you to try your hand at a wee bit of weaving by running a wooden bobbin through an actual tapestry. And, as a souvenir of your experience, everyone will take home their very own bobbin. While enjoying resplendent views of the city and exploring the castle's massive fortifications, revel in the tales of royal intrigue surrounding the wars for Scottish independence, as shared by your local expert. Edinburgh is rich in history and eye-catching architecture. Stroll the Royal Mile, the commercial center of Old Town, and hear the Scottish brogue sing to your ear in passing conversations. You're sure to fall in love with this winsome city as you explore the shops, restaurants and historic buildings of Lawnmarket and High Street. At dinner time, feel free to ask your Adventure Guides to recommend the perfect place to have a family meal. *Holyroodhouse Palace may be closed on some dates in May and June due to Elizabeth, Queen of England, being in residence. In the event the Palace is closed, a tour of St. Giles Cathedral and the Thistle Chapel will be featured. 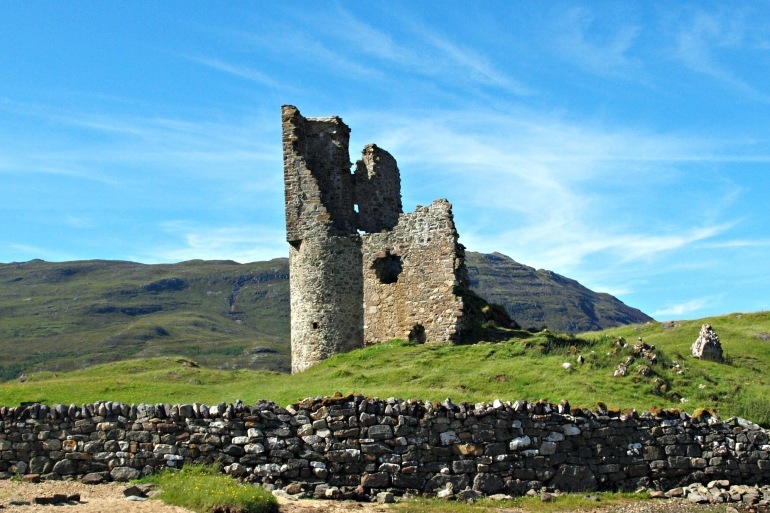 Climb back aboard the coach and resume your scenic trek to the Isle of Skye. As you cross the Skye Bridge that spans Loch Alsh, revel in the views of the stunning coastal scenery. Overlooking the waters of Portree Bay, with spectacular views of both the Sound of Raasay and the grand Cuillin Mountain Range, this comfortable hotel is your home for the next 2 nights. Unwind in the lobby as your Adventure Guides take care of your luggage and check-in. Calling all Scotch whisky lovers! Try varieties of this smoky liquor at a private tasting event. A drop or two of water? Or none at all? Delight in the nuances of selected blends and single malts. While adults eat at their leisure in the hotel restaurant, Junior Adventurers join the Adventure Guides for their own supper shindig, topped off with mini-highland games! Play classics like Tug of War and Wellie Boot Toss. Adults have the opportunity to mingle as Junior Adventurers enjoy a private screening of a Disney movie. After breakfast at the hotel, board a coach for an unforgettable ride to the rugged Sound of Raasay. Along the way, keep an eye out for the Old Man of Storr, a large standing stone that rises above the jagged formations that crown the hilltops blanketed in mists. Grassy pathways take you over gentle verdant hills to Brothers Point, a rocky promontory that reaches out into the sea. Hike as far as you choose on this walk surrounded by enchanting views of the shining waters, rugged shoreline and endless sky kissing the horizon. Rest up for a moment on the short coach ride to The Quiraing, a hilltop with an even more breathtaking landscape. The hike into the grass-carpeted hills rewards you with jaw-dropping sights as you look out over the sparkling blue bay and the slopes that tumble past spectacular land formations. On a sunny day, you can see for miles across the waters to the mainland and Hebrides Islands. Return to Portree and join the talented pastry chef at the Isle of Sky Baking Company to see how Scottish scones are made! Try your hand at creating one of these buttery treats yourself. Enjoy an engaging performance of Céilidh (pronounced "kay-lee") dancing by local school children who perform traditional Scottish dances and play musical instruments, including bagpipes and accordions. Set off for dinner on your own in this charming little seaside town! Fresh seafood, Scottish traditional cuisine and much more is on the menu. Don't hesitate to ask your Adventure Guides for dining recommendations. Relax as your Adventure Guides check you into this stylish new annex of the Kingsmills Hotel. Nestled in the countryside, these comfortable accommodations are your home for the next 3 nights. This evening at the Kingsmills Hotel, select your meal from an a la carte menu and dine at your leisure. Board a flight to the place where Gaelic is spoken alongside English and the scent of peat drifts in the wind. This most northerly of the Hebrides Islands, Lewis is full of friendly people and intriguing ancient sites, as well as many inspirations for the movie Brave! Imagine what it was like to live in a blackhouse, where local people and their domesticated animals dwelled together under the same peat roof! On a privately guided tour, find out how this unique and precious relic of a bygone era has been preserved. Venture to Dun Carloway to see a broch—an ancient stone structure from the Iron Age only found in Scotland—and hear what scholars know about life in that era from its remains. Step between the mysterious standing stones just as Merida does on her journey in Brave. Your guides reveal some of the scientific theories about the site, as well as the folklore surrounding how the stones came to be. Dine on typical local Scottish fare in Stornoway. Fly back to Inverness for a delicious dinner. After an invigorating day on the Isle of Lewis, revel in the simple cooking, friendly service and warm, welcoming ambiance of The Mustard Seed, where you and your fellow adventurers will enjoy a delightful dining experience. Marvel at the architecture of this restaurant that was once an old church, bringing the old and new together in an appetizing way. Welcome to wild Scotland! Fuel up for an active day with a delicious breakfast at the hotel before embarking on a journey to Rothiemurchus Estate—one of the greatest tracts of natural forest in Britain. The ancient woodland forest is home to an extraordinary variety of wildlife, as well as pretty Loch an Eilein, with its 13th-century castle sitting on the lake's wee island. The glorious scenery will steal your heart if the mop-headed Highland cattle don't steal it first! Junior Adventurers will mount up and spend the morning riding the Highland ponies over peaceful hills and heather moorlands, past stunning views of the Cairngorm mountain range. Join an expert on the estate grounds for a private lesson in archery. Don't have a longbow and quill? Nae problem! All equipment is provided. May the sure aim of Merida inspire you. Set off for dinner on your own in this ancient capital of the Highlands, once the home of Pictish Kings! From traditional to contemporary, local to international, Inverness offers a rich variety of culinary experiences in riverside restaurants, bustling bistros, country houses or even castles. Don't hesitate to ask your Adventure Guides for dining recommendations. *Horseback riding activity is for Adventures 16 years and under and has a maximum weight limit for each rider of 200 lbs (90.7 kg). Please note that this activity is not available on adults-only departures. Share a buffet breakfast with your family at the hotel before boarding a coach for a scenic 3-hour trip across the Scottish Highlands! Your tour of Scotland's historic castles continues as you travel by motor coach to Glamis Castle, whose grim history inspired one of Shakespeare's most renowned plays—Macbeth. You'll discover the surprising truth about King Macbeth and marvel at the sumptuous décor of this stately castle where the Queen Mother herself was born. Enjoy a hot lunch from the castle's restaurant. Depart Glamis Castle in the late afternoon and head back to Edinburgh Castle where you'll enjoy a reception, complete with live bagpipes music. You'll then celebrate the end of an extraordinary vacation as you toast your newfound friends at a farewell banquet in the castle—and prepare for a big surprise!